What a great first trip to Tobermory! A long weekend with beautiful weather and great new friends! The world-famous Grotto! Look at the colour of that water! After a relaxing bus ride out of the city, enjoying the views and the nature that gradually took over as we got further and further north, we arrived at Cyprus Lake campground. Once we got to our campsite and set up our tents, we went for a short hike along Cyprus Lake before dinner. After the hour-long hike, the notion of dinner sounded great! While dinner was being prepared, a few people got the fire ready so we could eat by a warm fire. Food always tastes amazing when camping, especially after a long day, and is often people’s favourite part of the day. This was no exception. Once everyone enjoyed seconds and dinner was done, we played a fun game to get us moving and work up an appetite for dessert. For dessert we stuffed marshmallows and chocolate chips inside a banana, tossed them in the fire for a moment, and YUM! A delicious banana boat! (like a smore but with bananas instead of graham crackers)… SO DELICIOUS! After dessert, everyone was stuffed and tired. We had a big day ahead of us and we were all keen to head to our tents. We were all out cold around 10:30 pm, with the intention of waking up at 8am to get a good start the next morning. Everyone woke up around 8 and got ready for the day while breakfast was cooking. Having packed a lunch, snacks, and water, we all sat around the fire, ate breakfast, and then set off on our hike to the Grotto! And of course, cameras were essential! Along the way, we took a detour to see a shoreline of Georgian Bay before the Grotto. We arrived to huge waves crashing against the rocks and beautiful clear blue water that was different than the water at Cyprus Lake. Someone in the group described it as the “opening ceremonies” to what was to come at the Grotto, and I couldn’t agree more! We explored a bit, had a snack and then kept on our route. Walking along the trail was beautiful. The trees were stunning and some had character and fascinated everyone walking by. Some were curved, up-routed, bent, and some were even fused together! The Grotto was breathtaking! It is a treasure finding such a beautiful place in Ontario. With its gorgeous rocks, tremendous caves, and clear blue water, everyone was just happy and enjoyed the warm sun! We explored, took pictures, skipped rocks on the water, dipped our feet in the water, and then simply sat and took it all in, admiring everything. After a couple hours, we enjoyed a lunch by the water. After lunch we kept exploring and found some caves. I took a part of the group down into one cavern where we got to feel the excitement of going off-trail. Walking on the rocks and exiting through a tunnel that not many knew about was fun and our own secret. We got to do this special thing that not many visitors get to take advantage of. We kept on our way, taking in breathtaking views, and returned to the campsite via a different route so we could see more of the scenery. We came to a pebble beach where, like the name implies, the whole beach was rocks and pebbles. 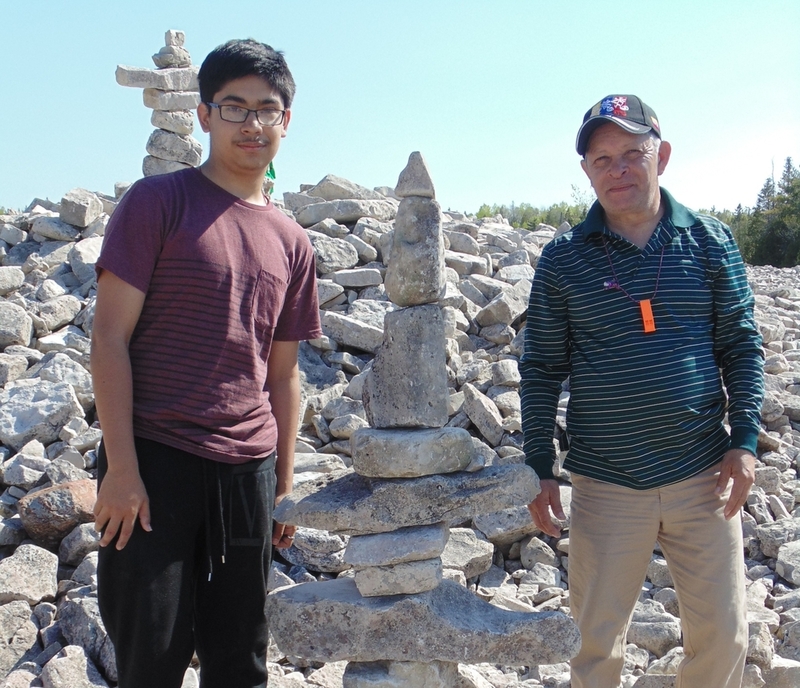 We decided to build inukshuks. It was so much fun to see some people work together to build tall ones and others work alone to build smaller ones. Some fell (multiple times --haha) and some we left standing as we continued on our way. The trail back was rockier compared to the dirt path we followed to the Grotto. It was nice to get to see two kinds of trails. Soon enough we were back at camp. We were pretty tired so decided to relax and play some card games. After a while we started a fire again and started making dinner. This was a totally different experience from the day before since this time, it was much later and we had to depend on our headlamps to see. It was very cool and made cooking that much more fun! 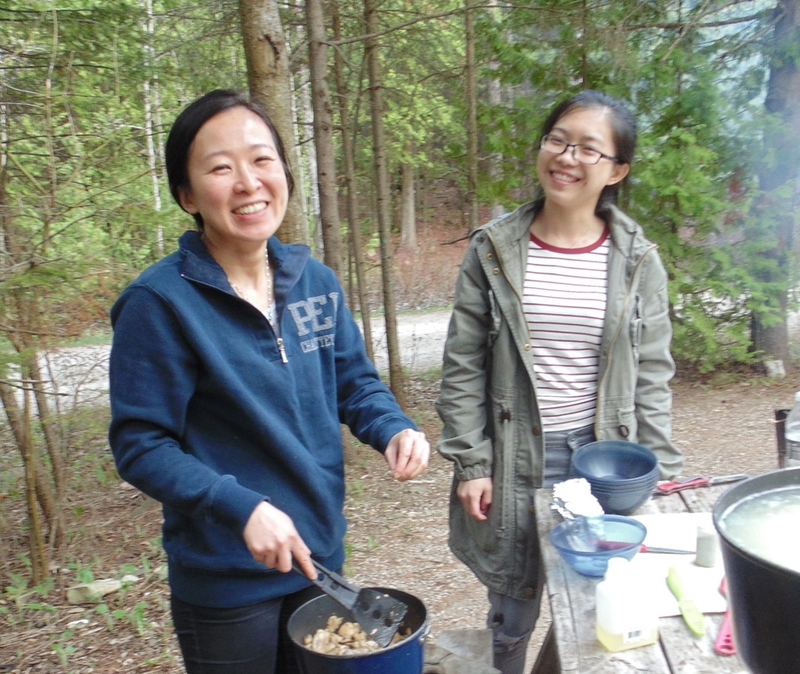 While enjoying the delicious meal we made, we shut our headlamps off and looked up to see the stars appearing. We all pointed out stars we knew and just kept looking as more and more appeared. After dinner we chatted by the fire and some slowly went off to bed, while others stayed by the fire chatting and star-gazing. By midnight everyone was in their tents and ready for a well-deserved good night's sleep. The next morning, everyone woke up to bagels and a hot drink! After breakfast people started cleaning up and packing up. It was our last day so once everyone had their tents away they went on a short walk along Cyprus Lake. When everyone was back at the campsite, we played some cards again until lunch time. After that, it was off to the bus! It was an amazing trip filled with beautiful views, lovely people, awesome food, fantastic weather, and hopes to come back! Amazing new friends and an amazing view! What a great weekend!